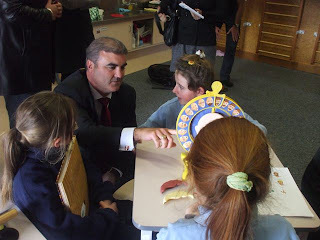 Clayton Cosgrove MP for Waimakariri visited Addington today to look at the Conductive Education Unit and talk with Teachers and parents of students attending. Mr Cosgrove was contacted by a concerned parent who lives in his electorate. Our principal Trudy Heath, Dave Ching, NZ Conductive Education Foundation member, and Teachers and Conductors from the Unit spoke with Mr Cosgrove about the history of the Unit, its funding, and the impact of funding cuts on our families. Brittany and her Mum, Julie Baker, spent some time, outlining to Mr Cosgrove and the Christchurch Press reporters with him, the consequences for their family in particular. At the end of his visit Mr Cosgrove thanked Trudy and her team and said he was now very aware of where our students would be without Conductive Education and was committed to assisting the school raise the profile of our funding issue.